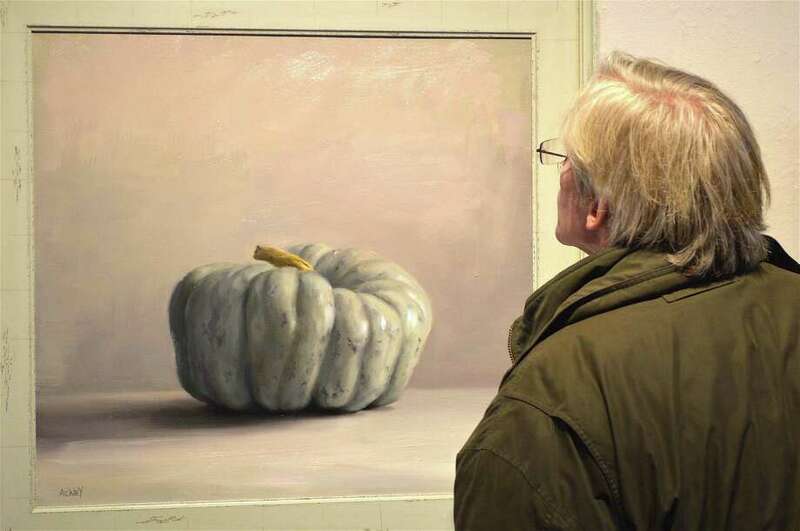 Michael Brennecke of Westport studies a painting by Pam Ackley of New Canaan at the Silvermine Arts Center's opening reception Jan. 8 in New Canaan. The Westport Farmers Market has received a $10,000 grant from Newman’s Own Foundation, the independent foundation created by the late actor and philanthropist, Paul Newman. The grant aligns with the foundation’s nutrition focus on connecting farmers to the community and making fresh produce available. Over ten years later, the market is thriving. It boasts some of the strictest standards for participation in the state, over forty vendors, and an active indoor winter market. The Westport Farmers Market is a 501c3 organization that provides fresh, local, healthy, and seasonal food to the community. The mission of the Westport Farmers Market is to create and maintain a regional hub where real farmers connect with consumers over real food. The grant by Newman’s Own Foundation in Westport will allow the market to increase the breadth and depth of all of its programming. Sarah Lepisto of Westport has been named to the fall 2016 dean's list at American International College in Springfield, Mass. Dean's list students are full-time students with a grade-point average between 3.3 and 4.0. Cyrus Burris of Westport has been named to the Champlain College dean's list for the fall 2016 semester. Students on the dean's list have achieved a grade-point average of 3.5 or higher during the semester at the Burlington, Vt. school. Burris is majoring in management of creative media. Dean College in Franklin, Mass. is pleased to announce that Katharine Fox of Westport has earned a place on the dean's list for the fall 2016 semester. Keene State College in New Hampshire announced that 1,400 students have been named to the fall 2016 dean's list, including two Westport natives: Gregory Carl and Olivia Mechanic. Five Westport natives at Lehigh University in Bethlehem, Pa. attained dean's list in fall 2016. Eliza Donovan, Jordan Goodness, Jackson Livingstone, Renee Reiner and Tyler Scanlin earned a scholastic average of 3.6 or better while carrying at least 12 hours of regularly graded courses. The University at Albany in New York congratulated more than 3,500 students who were named to the fall 2016 dean's list. From Westport, Shari Friedman and Yael Dror earned at least a 3.5 grade-point average. The American Red Cross has a severe winter blood shortage and is issuing an emergency call for blood donors to make a donation appointment now and help save patient lives. Hectic holiday schedules for many regular blood donors contributed to about 37,000 fewer donations in November and December than what was needed. Snowstorms and severe weather have also impacted donations. About 90 blood drives were forced to cancel in December, resulting in more than 3,000 blood donations going uncollected. Currently, blood and platelet donations are being distributed to hospitals faster than they are coming in. Find a blood donation opportunity and schedule an appointment to donate by using the free Blood Donor App, visiting redcrossblood.org or calling 1-800-RED CROSS (1-800-733-2767). The Red Cross is extending hours at many donation sites for more donors to give blood or platelets. A Westport mixed-use property near the Fairfield line has sold in a deal worth more than $4 million. Avison Young this week announced its local office arranged the $4.16 million sale of the property at 1835 Post Road East, which includes three buildings totaling about 10,700 square feet. Built in 2001, the buildings were fully occupied. Tenants include Walpole Woodworkers, Fjord Fisheries and Shoreline Pharmacy, which recently signed a long-term lease for the front building. It is the third recent acquisition Avison Young has arranged on behalf of the buyer, Blackshaw Hunchar. The new owner has appointed Avison Young as property manager for the assets, which feature a mix of retail, office and residential space. The seller was Green Farm Associates, represented in-house by Gary Bellard. The property at 1835 Post Road East features modern retail and office space on a high-visibility corner location with traffic light next to Shake Shack and across from Stop & Shop, HomeGoods and Panera Bread. The 0.63-acre plot includes 34 parking spaces and is not far from exit 19 of Interstate 95. Toquet Hall, Westport’s teen center, is accepting applications for its middle school and high school governing boards. Established in 1998 by the Westport Youth Commission as a safe, substance-free place “for teens by teens,” the Toquet Hall governing boards play an integral role in helping to shape the programs and style of the teen center. Through this opportunity, Toquet Hall provides a forum for youth to serve as community assets, develop leadership skills, planning and decision making skills, and interact with people of different interests and backgrounds. The governing boards meet bimonthly to discuss upcoming programs, review press kits, assist with fundraising initiatives and create promotion strategies. Students will gain valuable volunteer experience in a fun and unique setting. Applications are available at toquethall.org and any student who lives in Westport is eligible to join regardless of where they attend school. Please contact Kevin Godburn or Kiernan Castro at toquethall@hotmail.com or 203-341-1155 with any questions. Also watch for upcoming programs by visiting the website or following Toquet Hall on Instagram, Twitter, or Facebook. Connecticut Fish and Wildlife posted on its Facebook page that, “among other things, these sites offer information on how their products can simplify the purchase of a CT fishing license or hunting license. All of the state licensing information that one needs can be found on the DEEP Sporting Licenses webpage at www.ct.gov/deep/sportsmenlicensing. Person-to-Person is in the process of conducting a comprehensive inventory in the Darien Clothing Center. During that time — due to the generosity of so many in the community — the center will be unable to accept any new donations of clothing, household items, toys, etc. P2P, a nonprofit that provides low-income individuals and families living in lower Fairfield County with basic emergency services, will begin accepting donations again starting Jan. 23. With offices in Darien and Norwalk, the Person-to-Person service area includes Darien, New Canaan, Norwalk, Stamford, Weston, Westport and Wilton. More information may be found at www.p2pHelps.org. The Fairfield Museum and History Center will host its ninth annual IMAGES Juried Photography Show to celebrate the exceptional work of talented photographers in the region. Entries will be accepted through Feb. 5. Professional, serious amateur and student photographers from Connecticut, New York, Rhode Island and Massachusetts are invited to participate. The show will be on display from March 9 to April 30. The photography of Joe Standart will also be on display. Visit fairfieldhistory.org/exhibitions-2/images for information or to enter. Fairfield University’s Department of Public Safety, in collaboration with Trumbull Emergency Medical Services, will offer the skill-enhancing Emergency Medical Technician Basic Course from Jan. 18 to May 6. The course will take place at Fairfield University on Monday and Wednesdays, from 6 to 10 p.m., and some Saturdays. The course meets education requirements established by the state and the National Registry of Emergency Medical Technicians and is requisite for EMT certification. State-certified instructors lead students through a semesterlong course focusing on patient assessment and emergency care of the pre-hospital patient. With approximately 160 hours of classes, this comprehensive EMT course meets the state requirement of instruction and practice necessary for registration for the two-part EMT National Registry examination. Successful completion of the course and, by extension, the exam, ensures EMT certification through the National Registry in participating states. Areas of instruction covered through lectures and hands-on practice include: CPR, general pharmacology, respiratory emergencies, cardiovascular emergencies and OB/GYN emergencies, musculoskeletal, head and spine trauma, soft tissue injuries, hazardous materials, ambulance operations, emergency medical techniques for children and scene safety. The cost is $985, not including textbooks. Upon completion of the class, there is an additional state testing fee of approximately $100. For information or to register, contact Frank Ficko of the Fairfield University Department of Public Safety at 203-254-5524 or visit fairfield.edu/emt.